You know Google's Street View cars? You probably thought they were just gathering photos and route data, right? Well it turns out there's more. Under the hood of Google maps is the Ground Truth Project: an automated, artificial intelligence system which scans and interprets those streetview shots for relevant information and then integrates it into Google's maps data. It could be the reason why Apple will struggle to keep pace with the Mountain View monolith in the mapping wars. 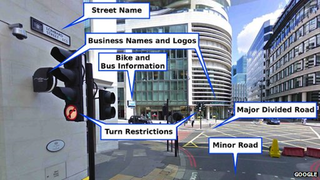 But Google's computers also analyse the images to identify street signs, speed limits, addresses, business names, rights of way at road junctions and other information. Human operators then check over each area to correct mistakes before the data is incorporated into the maps. "The benefits of having Street View can't be undercounted," Mr McClendon says. "We have over 20 petabytes [21.5 billion megabytes] of imagery and have driven and published over five million miles of Street View roads." With this technology, Google has become less and less reliant on depending on third parties for maps data (which means no licensing fees! ), and is now functional in 31 countries. And aside from Ground Truth, McClendon also voiced his commitment to mapping the interiors of public spaces, along with developing 3D models for buildings.